Cleaning your house does not have to be an overwhelming task – even for the busiest of people! With a spontaneous approach to cleanliness, it is common to feel like you never have enough time or energy to get all the housework done. You might even feel the urge to rush into large cleaning projects, eager to make noticeable changes, and end up burning yourself out. 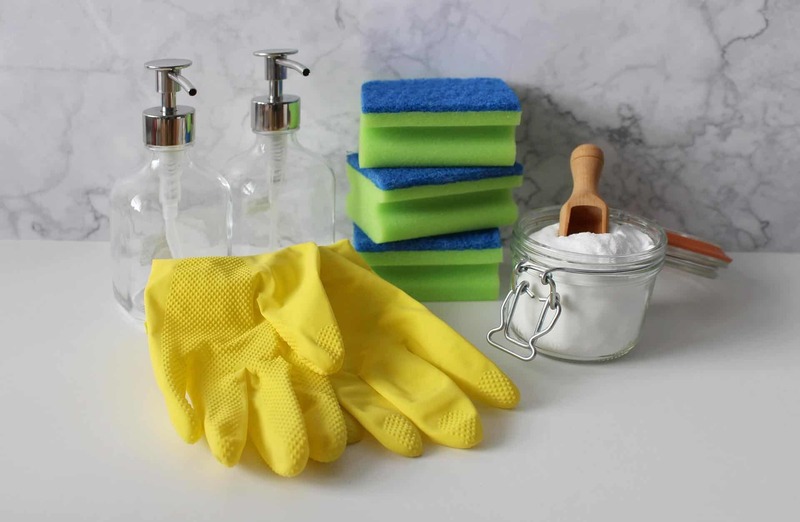 With the help of a cleaning schedule, you will be able to set yourself realistic expectations about housework and keep track of what you need to do. Before you create your schedule, you need to plan what tasks should be included. You can start this process by making a list of what needs to be done in every room of the house. It may help to visit each room as you do this. After finishing the list, write down next to each task how often you would ideally like to clean them. For example, making your bed and cleaning your dishes would be a daily task, while changing your bedding would be a weekly task and emptying your vacuum cleaner should be done every month. After organising the tasks by their frequency, re-read the list. Is there anything you’ve missed? How much time do you need to spend on each task? Have you over-estimated how much you can do in a day / week / month? When thinking about this last point, make sure you have left yourself plenty of time for rest and relaxation. You don’t want to spend all your non-working hours cleaning! If you feel like you have taken on too much in one day or week, prioritise the most important tasks, and consider which tasks can be done less frequently or be given to someone else to do (this can be a person you are living with or a professional service). What is working and what can be improved? Are there any tasks which are taking longer than you initially thought? What tasks have you delegated? Make the changes you need to, making sure that your cleaning schedule is both realistic and flexible to suit you. Get your annual, weekly and blank cleaning schedules when you sign up to our mailing list. 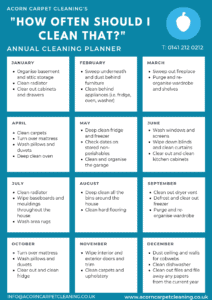 For your annual and seasonal cleaning tasks, plan ahead and choose the best month to get them completed. Some tasks may be better suited or more convenient to do at different times of the year. For example, many people focus on cleaning their windows at the beginning of the summer months and may organise their files at the end of every year. Be flexible. Some days you might be feeling productive and achieve more than you planned. Other days, you won’t have the energy or time to fit everything in – or an unexpected event might set you back. When this happens, prioritise the most important tasks. If you find yourself stuck for time, ask for help. You can go to friends and family, or hire a professional service. 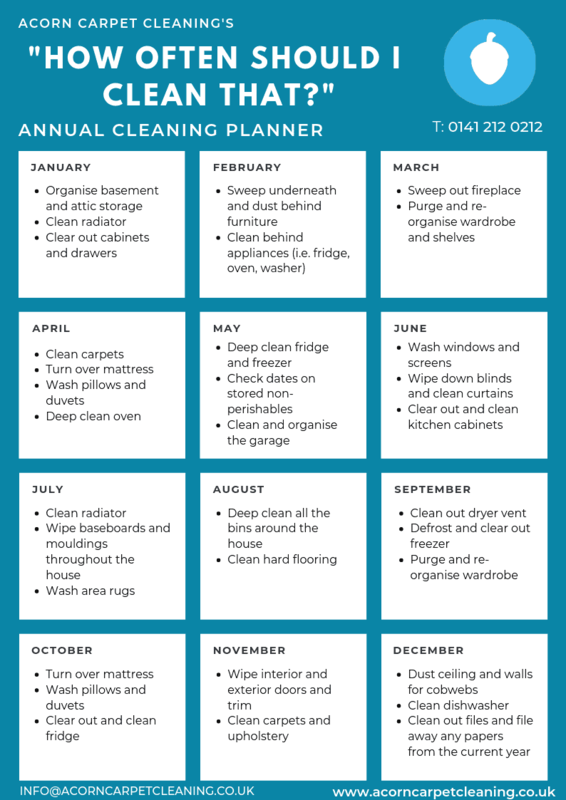 Need a template to help you plan your cleaning schedule? Click here to get your very own weekly and annual cleaning schedule! Acorn Carpet Cleaning is a Glasgow-based professional cleaning service that provides specialist cleaning for a variety of flooring types, upholstery and effective stain removal. For more information on our services, visit the home page.